The name Bulawayo comes from the name of the Zulu King Chaka’s kraal: GuBulawayo – translated as ‘he who has been hunted down to be killed’, although it is nowdays more commonly translated as 'the place of slaughter'. 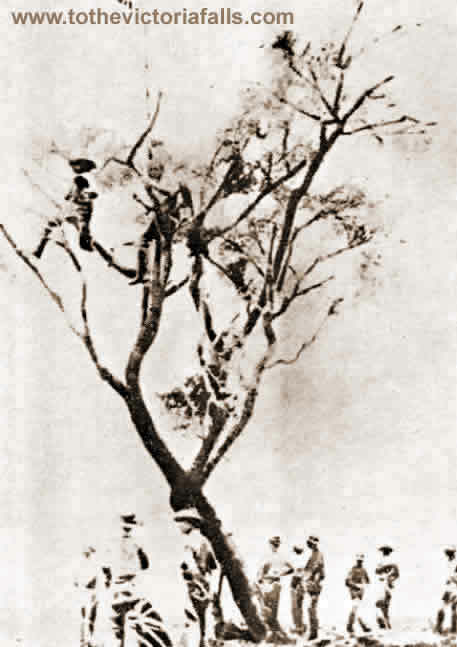 When Lobengula, the son of Mzilikazi, came to power after a bitter civil war, he remembered the name of the old kraal in Natal, and decided to call his capital by the same title, since, he is claimed to have said, "I have been injured by my people". After Lobengula became King of the Matabele in 1870 he departed from his fathers’ custom by allowing a number of white men to live in the vicinity of his chief kraal. Major Stabb tells us that in 1875 there were about a dozen white traders, concession-seekers, and hunters, as well as some general hangers-on, living outside Old Bulawayo, which was some 12 miles south of the present city. Some of them had put up quite pretentious homes for themselves: thus Mr H Greite lived ‘in a large one-storey cottage constructed in stone’ which he later sold to the Jesuit missionaries for £500, while another trader named Martin occupied a comfortable house on top of Lion’s Kopye a mile or two away. 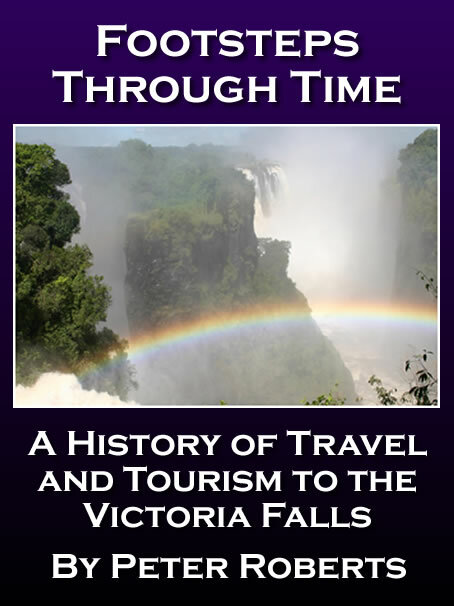 When Lobengula moved his capital to the hill of Umhlabatini, which today bears the buildings of Government House, he allotted an area on the other side of the Amajoda stream (now called the Bulawayo spruit) as a concession where Europeans might live. There, James Fairbairn built a residence which he grandiloquently named ‘New Valhalla’. Close by and overlooking the spruit stood the compound of his partners, the Dawson brothers: it contained several buildings including a well-built brick store house with a corrugated iron roof; beyond it James Dawson farmed a long strip of land adjoining the perennial stream. Towards the end of 1888 the Rev James Smith Moffat settled down nearby: he lived in a tent at first but soon replaced this with a mud hut. Captain Ferguson who visited Bulawayo in 1890 writes of other Europeans’ huts nearby which were ‘surrounded by ring fences of thorny mimosa bush’. We know that the largest compound belonged to the British South Africa Company and that it was three-quarters of a mile from the Matabele town; near to it were the enclosures of the Bechuanaland Exploration Company in which lived E A Maund and another one set up by Edward Renny-Tailour, which according to Mrs Lippet actually boasted a water-closet. When Mrs Lippet paid her visit to Matabeleland in 1891 she found Johan Colenbrander and his wife were camping out on the Umvutcha Road, some four miles north of Bulawayo, but a year or so later Colenbrander too put up a cottage beside the Chartered Company’s thatched hut. 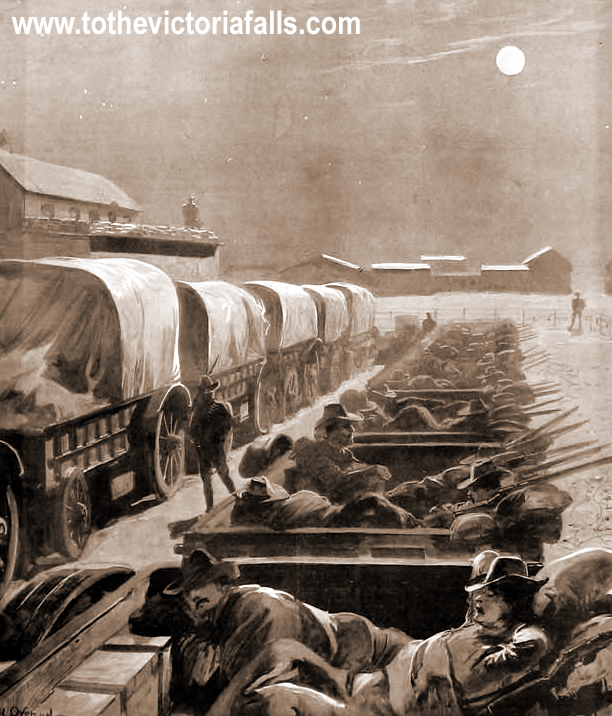 Some traders and hunters however, were content to live in their wagons at 'White Man’s Camp'. Moreover some of the more permanent residents changed their quarters and moved to other compounds when Lobengula’s grant of the Rudd Concession sparked off all sorts of company amalgamations and changes of allegiance. In 1893, when war clouds began to gather over Matabeleland, many of the Europeans living in the country slupped away to safety. The missionaries at Inyati left for the south; ‘Matabele’ Wilson trekked to Mashonaland; William Tainton, the court interpreter, panicked and one day left Bulawayo hurriedly without the King’s permission; and so the exodus continued. 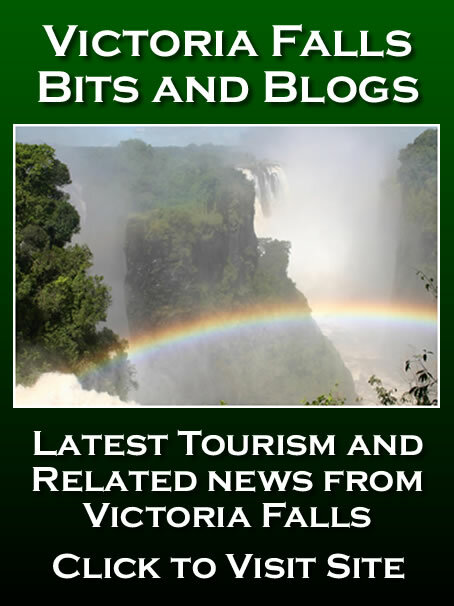 Two weeks after the Fort Victoria ‘incident’ the only Europeans left at Bulawayo were P D Crewe, the Colenbranders, Harry Grant, W Usher, James Fairbairn, and James Dawson. Then Grant succeeded in persuading the King to allow him to leave with some of the royal cattle. Next, on 20th August, Crewe set off to Cape Town on an official mission to carry Lobengula’s case against the Chartered Company to Cape Town and lay it before the British Government. A little later Colenbrander received permission to obtain guns for the Kings impis from Palapye, and finally Dawson got away too, setting out with three Indunas to make contact with the southern column of the white invasion forces. Following the 'incident' at Fort Victoria, to where a column of troops of the British South Africa Company had been sent from Salisbury in September 1893, the colunm was on the march again. Bound by the orders of Dr Lender Starr Jameson for Bulawayo, where, never a man to miss an opportunity, he intended to use the situation to maximum advantage to subdue Lobengula and the Matablele 'problem' once and for all. 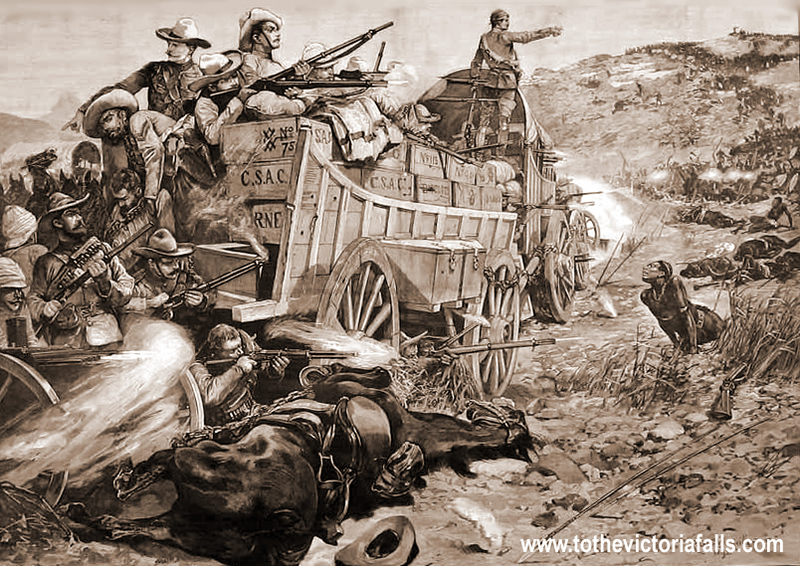 The column, defended with Maxim guns and seven-pounder artillery, was easily defended during the occassional engagements with the Matabele impis, whose animal-skin shields and wooden spears offered little hope against these machines of war. There were minor skirmishes along the way, but the Matabele soon learnt to retreat and fight another day rather than to die amongst the hail of bullets. 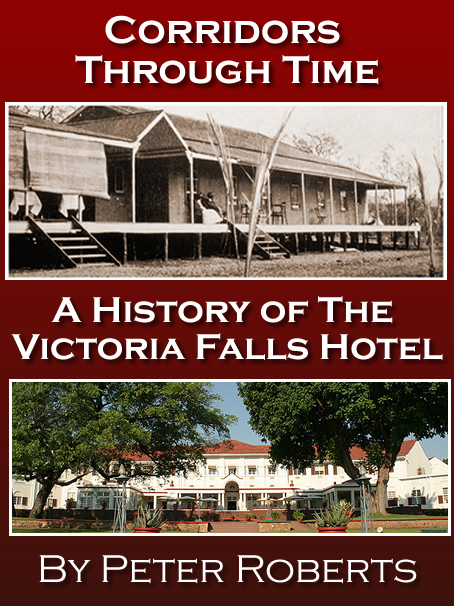 Later, when the Company’s town eventually rose on the abandoned site of Lobengula's royal kraal at Bulawayo its hotel was named ‘The Maxim’. The statesman-like tone may well have been lost on Lobengula. 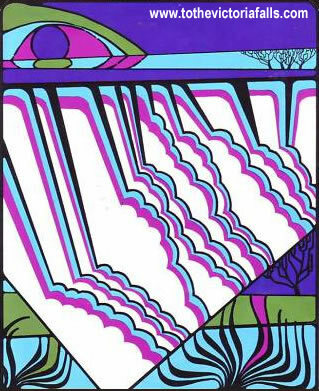 For five years, he had watched the inexorable intrusion of the white men. First they had come bearing gifts and begging favours. Then they had tricked him again and again. ‘There is a wall around the word of a king,’ he had once told Moffat when his friend, the son of his fathers’ friend, had asked him to put his mark on a piece of paper. What weight did the paper carry, compared to a solemn, verbal promise? Early in October, Lobengula made a final attempt to avert war. On the basis of a safe-conduct from the High Commissioner, he sent his own brother and two other envoys down to Tati, the nearest white emplacement. They arrived in the midst of hectic preparations. Troops of the Bechunaland Border Police, rushed north by way of the railway, were being assembled, rations and ammunition distributed, orders circulated. In the confusion, the three Matabeles were arrested as spies. Before explanations could be made, two of them were killed and the third forced to flee. What ever message they carried was not delivered. Despite Lobengula's apparent desires for peace, the new powers of influence over his land desired him, and his people, subdued and powerless, and were determinded on a coarse of action to achieve it. Lobengula had tried everything he could in his position to placate the white invaiders, but he had become a pawn in a rich man's game, and the rewards were too high and the odds too slim for him or his people to defend themselves against. Time after time he tried to avoid conflict with these superior forces, and his actions, to vacate his capital rather than fight, to leave his hostages behind, unharmed, and to leave white buildings and property untouched, all reflect his apparent desire for peace with the white man, even when pushed to the limit. All this however was still not enough to save him or his people. 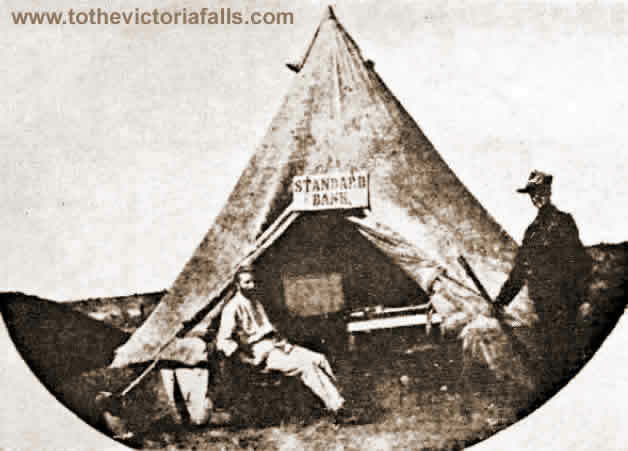 The first Standard Bank opened for business in Bulawayo on 4th May, 1894, using a bell tent in the Police Cap as an office until the Chartered Company's Administration building was completed a few weeks later. The first Manager was Alexander Thain and the Accountant D M Sanderson. The armed guard was supplied by the Chartered Company. 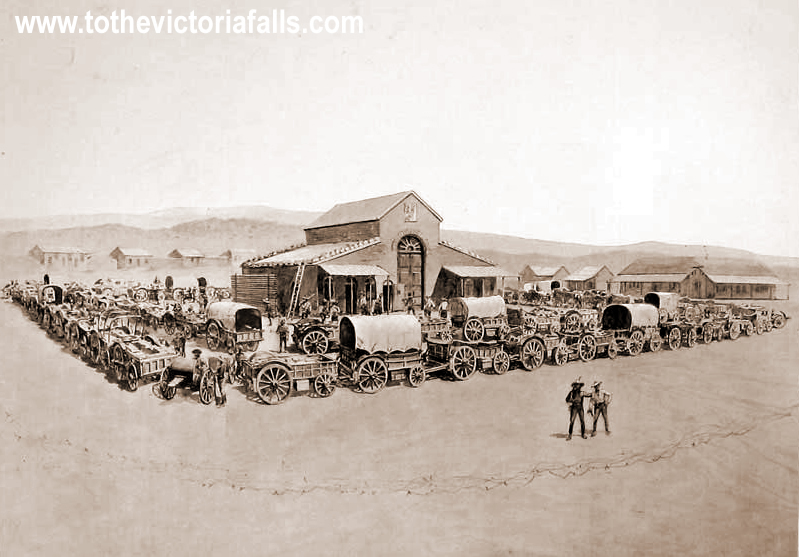 Bulawayo owes its spaciousness and wide streets to the idealism of Rhodes, who insisted that the streets were to be laid out on the grid pattern of an imperial Roman settlement, and that each should be wide enough to allow a wagon and a full span of 16 oxen to make a complete turn. To a young surveyor named Patrick Fletcher fell the task of putting these grandiose ideas into practice. Dr Jameson, in loco parentis, as it were, of the new town in Rhodes’s absence, insisted that each block must be quarter of a mile square. Fletcher questioned this by marking out a block to these dimensions, then asking Jameson to walk around it. The puffing doctor soon agreed that a tenth of a mile square would be a much more sensible size. Fletcher’s drawing board was concocted from packing cases for paper, he used white lining from biscuit tins, and survey pegs were converted assegais. 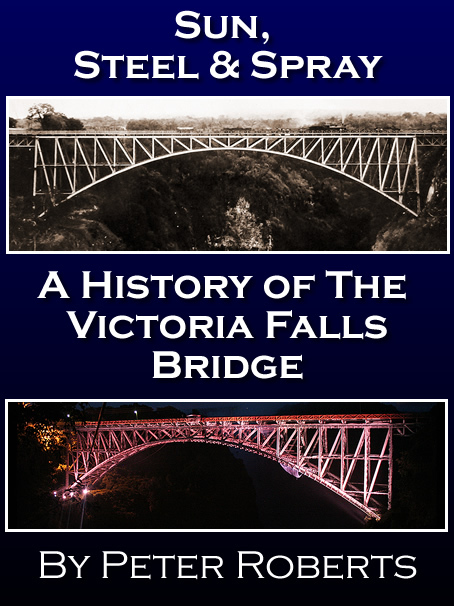 On 1st June, 1894, Dr Jameson officially inaugurated Bulawayo. Standing on a box outside the new Maxim Hotel in Fife Street, he announced: "It is my job to declare this town open, gentlemen. I don’t think we want any talk about it, I make the declaration now. There is plenty of whisky and soda inside, so come in." The colonial foundations of the town saw 400 claims staked within two weeks of Jameson’s amicable invitation. Within a decade Bulawayo had a population of six thousand, growing to become a major transport hub for the southern African region. The first months in Bulawayo were, by accounts, happy ones. A contemporary chronicler writes: "The gay reckless life went madly on... poker parties and dinners, tennis on new courts at the Bulawayo Club, dancing on the new rough floors, moonlight rides and picnics. Everybody was happy and confident that ‘tomorrow’ would reveal the gold that would make them all rich, that would make Bulawayo a second Johannesburg". An opera house intended to seat ‘nine hundred at a pinch’ was being planned: a roller skating rink – entrance fee a shilling in the morning, half-a-crown after six in the evening – had opened in the Market Hall, and moonlight bandstand concerts in Market Square were very popular. The population was growing so rapidly that the ladies of the town began collecting for a maternity home, and so numerous were the flag days that angry males demanded some release. It was therefore decided that in return for a handsome donation, a gentleman could claim a metal lapel insignia inscribed rather piquantly: ‘Bulawayo Maternity Hospital. Immunity Badge’. The Matabele Rebellion in 1896 cast a dark shadow over Bulawayo. The population went into defensive laager, and the official report describes the tenseness of the first months. "For a time, Bulawayo’s position was desperate. 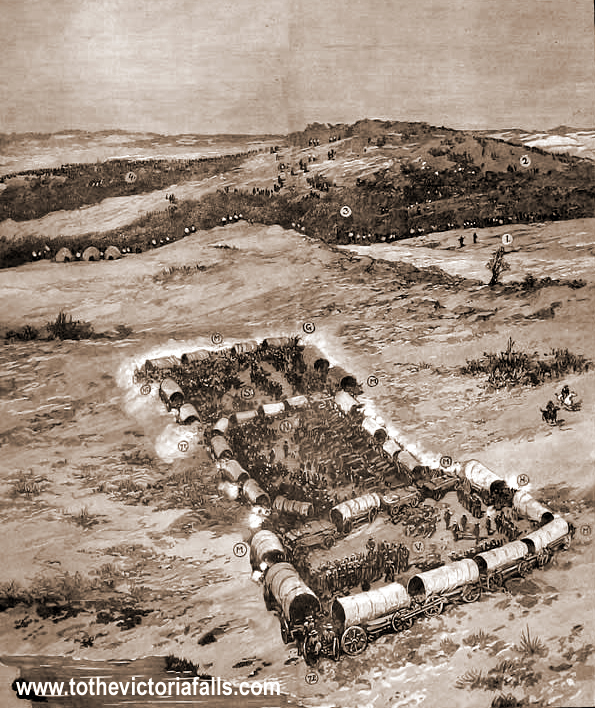 The immediate difficulty was in getting food supplies, forage, arms, ammunition and reinforcements to a population over 500 miles away from the railway base at Vryburg, and beseiged by 15,000 natives. This trouble was considerable augmented by… the rinderpest. " After months of fighting, Rhodes persuaded the Matabele indunas to discuss peace terms with him. His first intermediary was somewhat unusual: in August, 1896, a British patrol found an old African woman alone in her deserted kraal. She turned out to be Nyambezena, a widow of Mzilikazi, and mother of one of the fighting indunas. Rhodes and J P Richardson, one of the Native Commissioners in the Bulawayo area, immediately saw her value as an envoy, and asked her to return to her home and make contact with the rebel indunas. If they wanted to make peace, she was to fly a white flag over her hut: if they elected to go on fighting, she was to hoist a red flag. After four anxious days, a white flag was seen fluttering from Nyambezana’s hut. Rhodes himself met with the chiefs in the Matopo Hills to discuss peace terms. At the appointed meeting place, the men dismounted, and Rhodes sat himself on a large antheap. The huge crowd of Matabele approached. For the other men, those first few minutes were filled with trepidation, but Rhodes, exhilarated, was heard to murmur: "This is very exciting... this is one of the moments in life that make it worth living. " After several hours of discussion, the chief Matabele spokesman said to Rhodes: "It is peace, you have our word... we have submitted to you, our father and great chief. Only remain in the country to look after us. " Three more indabas were held before the final terms were agreed. Significantly, Bulawayo’s civic motto is now: ‘Let Us Go Forward Together’.